(Bloomberg) -- Nexi SpA fell nearly 8 percent in its Milan market debut, damping enthusiasm for Europe’s biggest initial public offering of the year, as some analysts suggested the stock may have been priced incorrectly while the chief executive officer warned against drawing early conclusions. The payment services specialist, whose listing raised 2.01 billion euros ($2.27 billion), declined as much as 7.9 percent, and was down 6.3 percent to 8.43 euros at 11:42 a.m. local time, giving the company a market value of 4.6 billion euros. A mix of existing and new shares had been sold to more than 340 investors from around the world at 9 euros each. Still, while demand from local and international investors was strong, the company offered shares at the bottom of a narrowed range. The IPO included a capital increase of 700 million euros. The IPO of the Italian credit-card issuer and cash-machine manager is the third major offering for a payment-processing institution in the region in less than a year, following Network International in London in April and Adyen NV in Amsterdam in June. The Nexi IPO is the largest in Europe since German brake maker Knorr-Bremse AG’s 3.8 billion-euro share listing in October. It is also the biggest in Milan since Pirelli & C. SpA returned to the market in 2017. 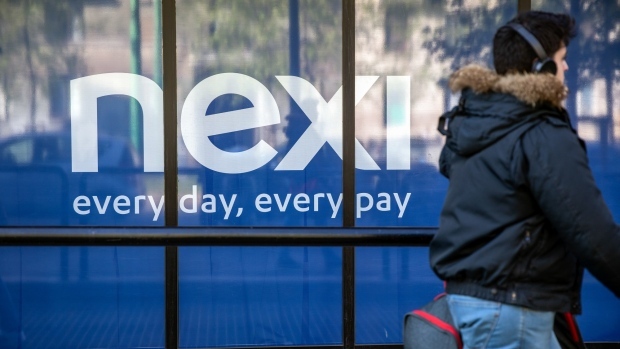 Milan-based Nexi is Italy’s biggest payment service company, operating in merchant servicing, card payments and digital solutions. It has partnerships with about 150 Italian banks and a 60 percent market share in card issuing. The company posted net income of 20 million euros last year. Investors include Advent International, Bain Capital and Clessidra SGR. --With assistance from Marco Bertacche.